was established in December 2013 in a remote fishing village in the south west of Senegal. The project aims to recognise and support artists who live in the village and to promote their work to a wider audience. In addition, the project raises funding through the sale of original art work and other means to help develop a sustainable income and creative arts workshop in the village and to enable artists to pass on their skills to young people. The project is supported by Trevor Pollard who is based in Sheffield, UK but lives in Kafountine between December and April. 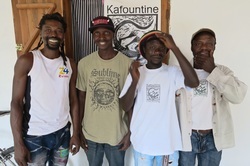 The group expanded from the original three members in December 2014 and now have a shop and print workshop in the main street of the village from where they can work and sell their prints.